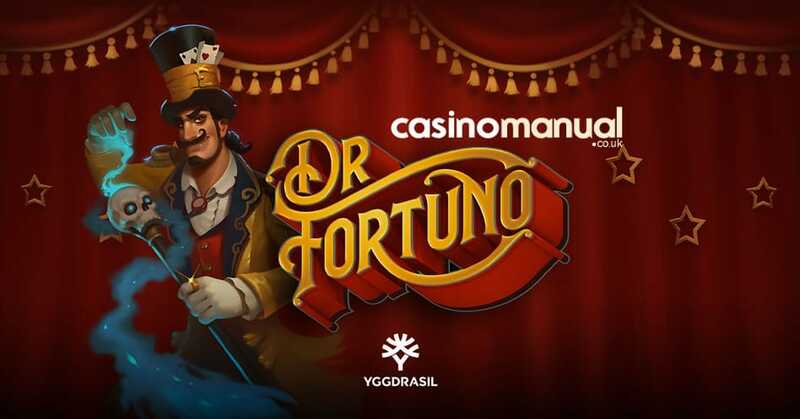 Enjoy a show at a travelling carnival in Dr Fortuno, a 5 reel, 20 payline video slot from Yggdrasil Gaming. Boasting superb sound and visuals, this circus extravaganza is packed full of extras including cash and multiplier prizes, free spins with added extras and big jackpot prizes. Play on your PC, tablet or mobile from between 20p and £100 per spin. You won’t find many better designed video slots than Dr Fortuno. Set against a carnival caravan backdrop, you’ll see bottle of potion symbols as well as a trio of higher value characters – the Water Witch, the creepy clown Fire Head and the Siamese Night Twins. The Twins are the most rewarding, paying 4, 6 or 20 times your total bet. Dr Fortuno is the wild. Whenever the bearded magic man hits, he expands/nudges to turn the whole of that reel wild. There are 2 features rounds in Dr Fortuno. A multiplier of between 2x and 5x of the spin amount. An instant win of between 1 and 5 times your bet. 2 added spins of the wheel. Chance to win the Jackpot prize (the Jackpot segment is now available on the wheel). All of the lower value symbols are removed from the reels. A 2x multiplier is in play throughout the feature, doubling all payouts. Extra Fortuno wilds are added which allows you to access the Wheel of Fortune feature. You’ll receive an extra 5 or 10 free spins. A higher value character symbol becomes a standard wild. Win both ways payouts are activated. Yggdrasil Gaming has created another cracking video slot here. The design is as good as you’ll find anywhere and there’s a magical feel to the soundtrack which has just the right level of creepiness. The features match the high spec sound and visuals too, delivering plenty of action and variety. You can win 800 times your bet on each free spin with the 2x multiplier but the biggest wins will come from the Jackpot in the Wheel of Fortune feature. We were very impressed with Dr Fortuno – this travelling carnival is a show you’ll definitely want to see. If you like magicians, Novomatic’s The Great Gambini’s Night Magic is recommended.